Each NASA center: such as Category:Johnson Space Center. 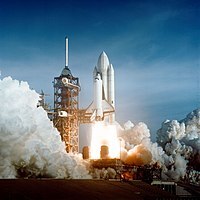 Each Shuttle: such as Category:Space Shuttle Atlantis (Endeavour, Columbia, Pathfinder, etc.). Move US astronauts to: Category:Astronauts from the United States or Category:STS crews, or see general Category:Astronauts (several astronauts have their own name sub-categories). Also note: Category:Logos and seals of NASA or Category:NASA document collections. For an outline of subcategories, see: "Commons:Category scheme space exploration". Thousands of those images all cross-link to Category:PD NASA. This page was last edited on 10 May 2018, at 05:17.